Hmmmm…It’s been a while since I last posted. Now where did I leave off? 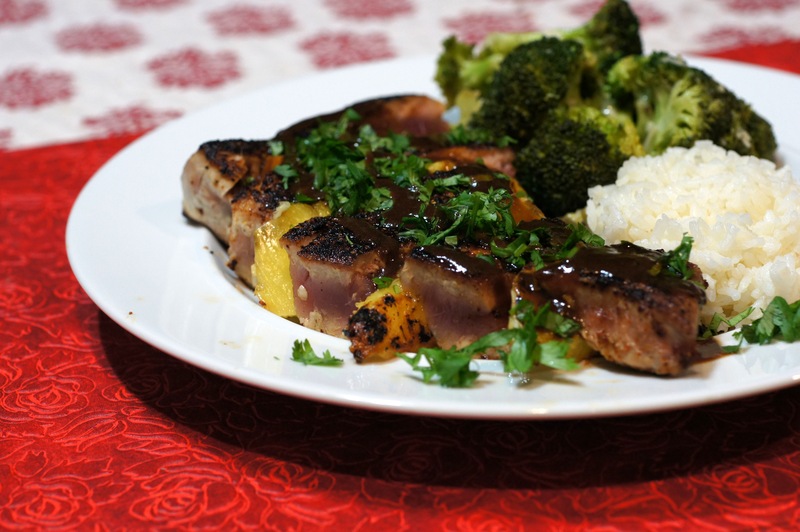 Oh, yeah, the Lamb Loin Chops Sous Vide with Red Wine Sauce and Garlicky Broccoli. Because Baby Lady doesn’t like lamb, I made her this dish and it was killer. Looks good, too, doesn’t it? Sorry I haven’t posted anything in a while. While I love the blog and all you readers, we have so much more going on in our lives and there are only 24 hours a day. It’s like one of the nephews explained when he was about 10 years old. There are 24 hours in a day. I have to sleep 8 hours a day which leaves me 16 hours a day to do the things I want and like. I have to work 8 hours a day which then only leaves me 8 hours to do the things I want and like. But every time I get to my 8 hours of “me” time, somebody is always taking a piece of my time either needing something, wanting something or making me do something, so by the end of the day everyone else has taken a piece of my time so none of it was left for what I want or like. Being adults, we explained to him it only got worse as you get older which, not surprisingly, didn’t make him feel any better. 🙂 While I love the blog and talking/writing about food, it has to take its position on the back burner occasionally. Also, just because we’re not writing and telling stories, this doesn’t mean we aren’t cooking. We are and now have a larger backlog of photos, recipes and stories to share. In fact, those of you who follow us on Facebook have seen some of the items we have been cooking. Slowly but surely we will get all of these items posted on the blog so just bear with us. This post is about tuna. We haven’t posted a cooked tuna recipe in a while but as I pointed out, Baby Lady doesn’t like lamb. Not even a little bit. It’s kinda like me and liver. So, when I fix lamb I also play the roll of short order cook and fix several meals for dinner. Generally, this isn’t a problem because you build the sides as the basis of the meal and simply change the protein. In this instance, I had the lamb and Baby Lady had this beautifully delicious seared tuna. This is what we did. Mix the soy sauce and dry wasabi powder to incorporate. Once incorporated, add the honey and Sriracha sauce to the mix and incorporate. Set aside until ready to serve. Peel, core & slice a fresh pineapple lengthwise. 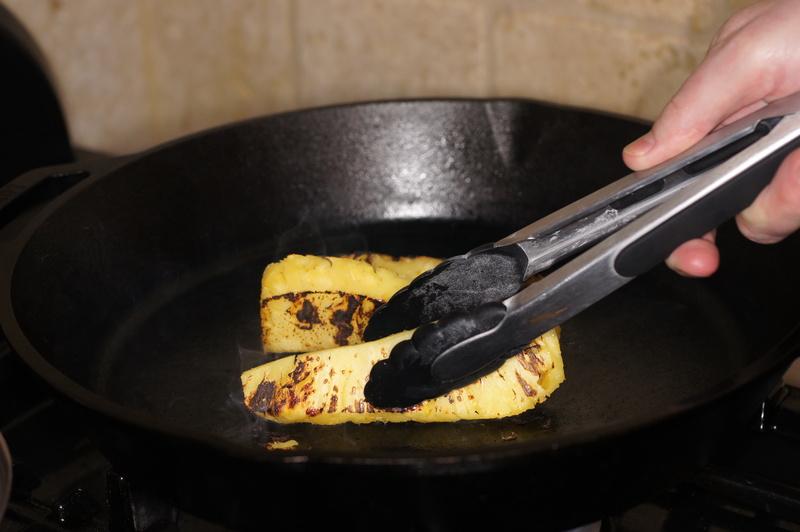 Heat a heavy bottom skillet over medium-high heat and add the pineapple slices. 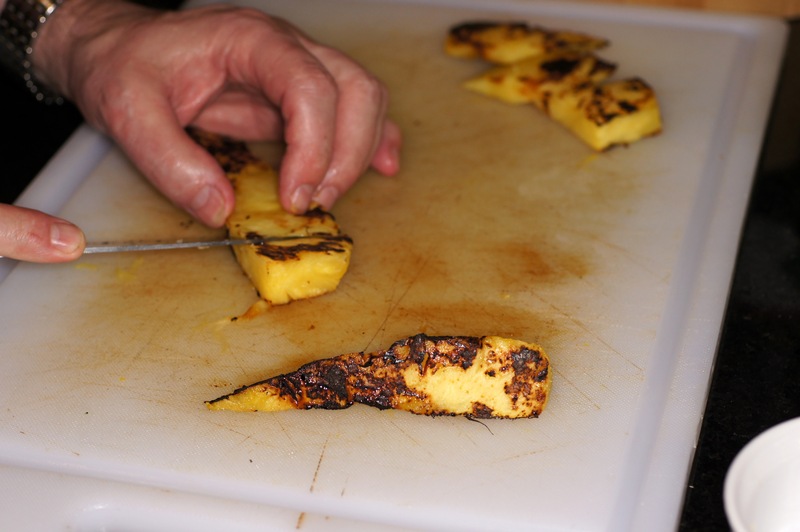 Cook the pineapple until it begins to brown and caramelize on the bottom and turn. Continue to cook on all sides. 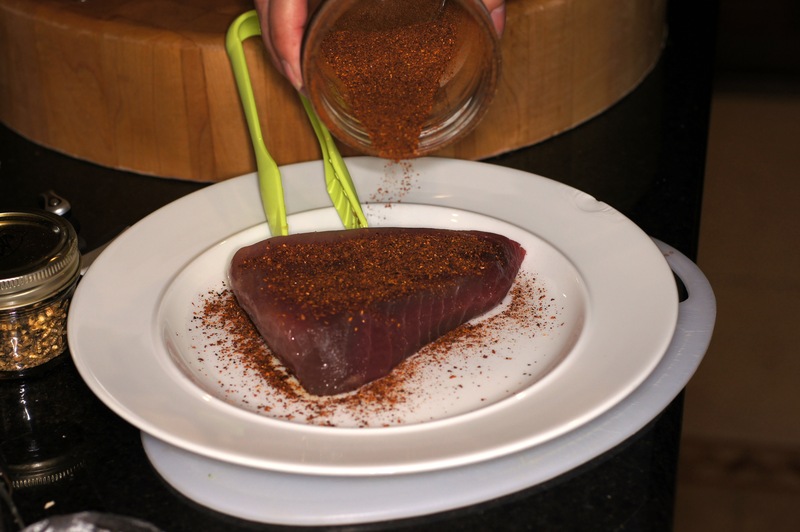 In the meantime, season the tuna steak with the ancho chile rub. 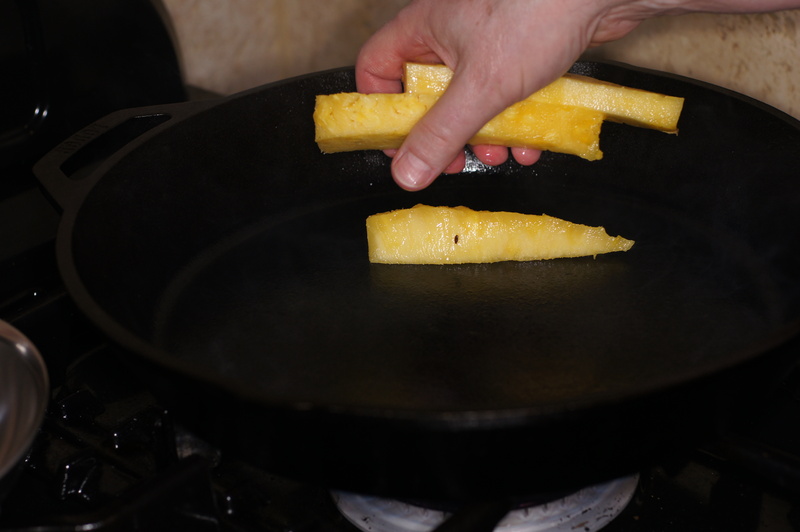 When the pineapple is done, remove the pineapple from the skillet, increase the heat to high and add 1 Tbsp olive oil. 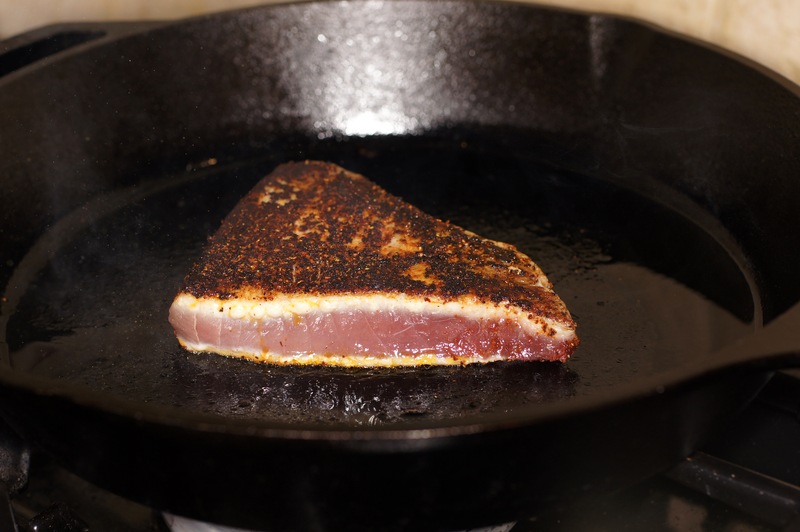 When the skillet and oil have heated, roughly 30 seconds or so, add the tuna steak. 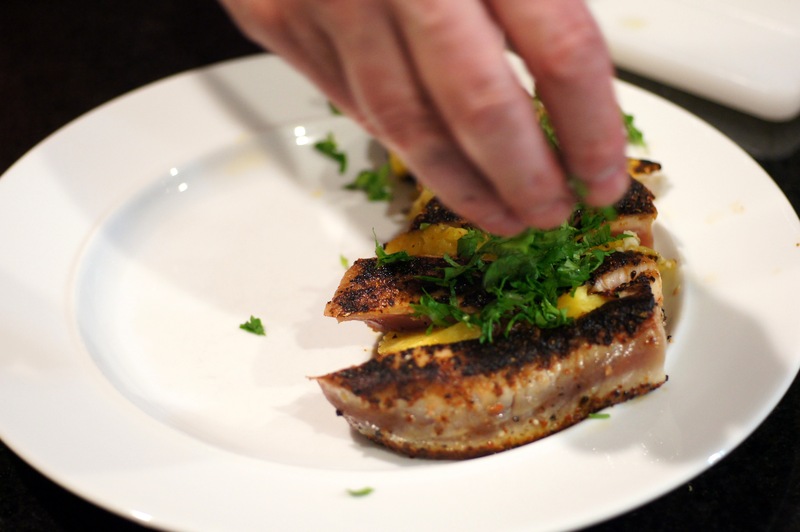 Cook for roughly 30 seconds to sear the outside of the tuna and spices. Then turn. 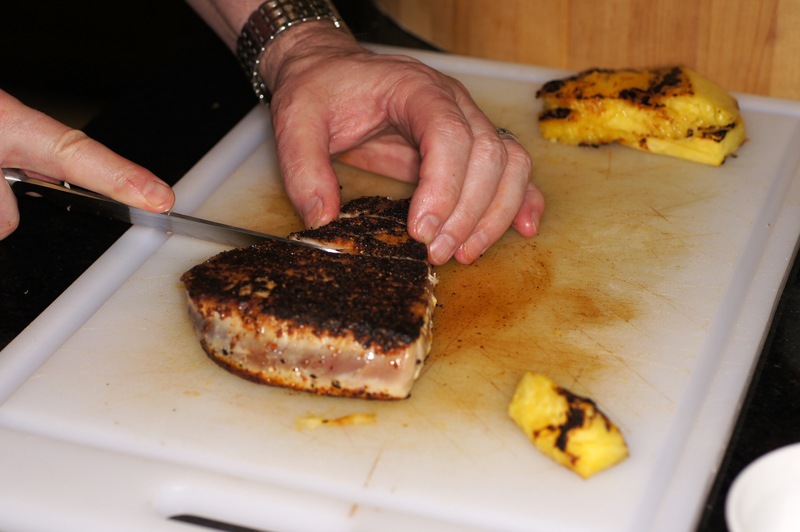 While the tuna is searing, slice the grilled pineapple on an angle. 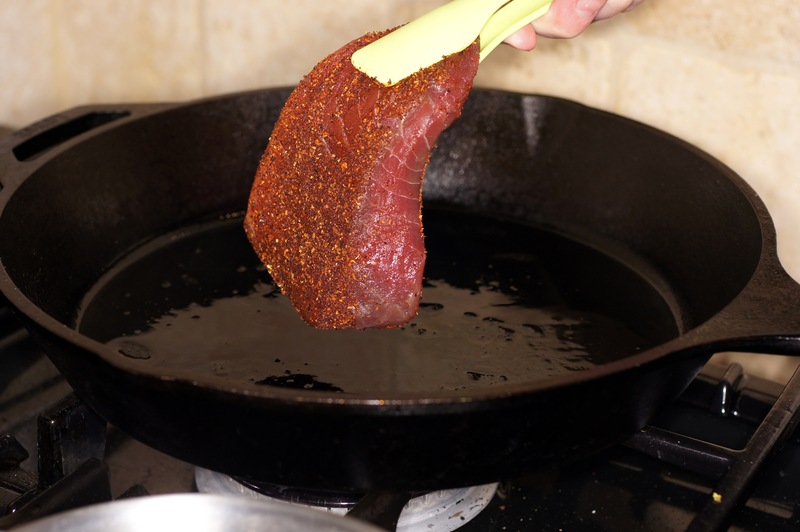 When the tuna is done, remove from heat and slice on an angle. 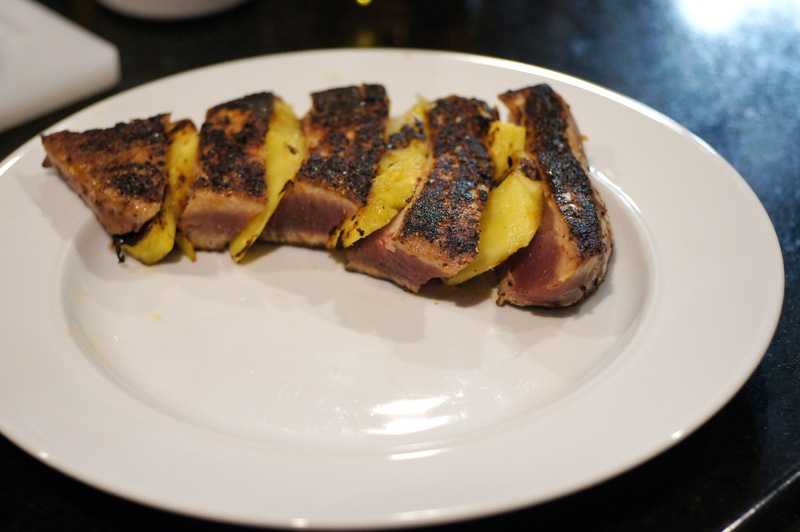 Arrange tuna and pineapple slices in alternating slices on a dinner plate. Drizzle with spicy honey glaze and sprinkle with chopped cilantro. Lovely. The tuna must be very fresh to cook it that way (the way I like it by the way, in case I ever get over there). We have missed you over the past couple of weeks. Good to see you back with a bang. Great to see you back! If it wasn’t for Facebook, I would have started to worry. I know what you mean about time. Right now I spend a lot of time cooking and on the blog, but I won’t keep that up forever. 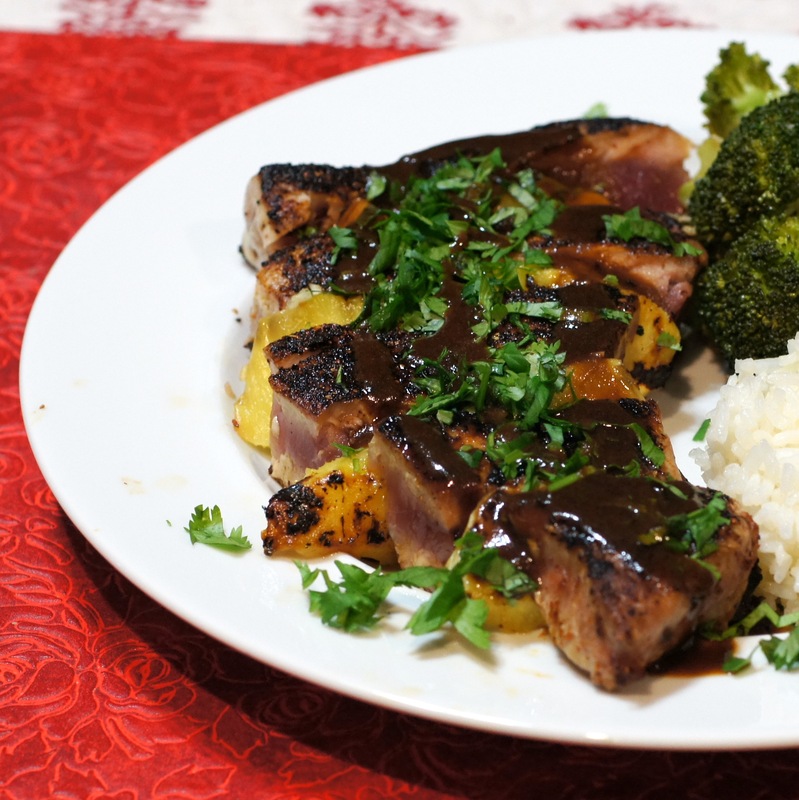 I love seared tuna and you made a nice version and presentation. I remember the fresh tuna we had in Hawaii and am so jealous. I would’ve picked the lamb though. The tuna with pineapple and honey would be quite a challenge for wine pairing! Dogded that bullet then 😉 Fresh pineapple pairs well with tokay with 5 or 6 puttonyos, but that would blow away the tuna. Looking Good I just love the way you cook .I love how you made the tuna very elegant.All your dishes belong in a 5 star restaurant.Keep bringing those dishes you do a good job. Glad to have you back, Richard, and this is a great dish to celebrate your return. Very nicely done! Richard’s baaaack!!!!! It’s like a giant Kabob!!! Love it! I’ve started posting only 5 days a week, because I was starting to post less exciting things, or making my husband wait until I got a photo, which made me rush….. blah blah blah. It’s a damn job, man!!! But it is fun. Cheerss!!! You are a thoughtful husband to create a separate meal for Baby Lady. I know she appreciates your making her such a terrific meal. Hi, Karen. Baby Lady is the love of my life, my heart and soul. I wouldn’t know what to do without her. So, when I do have to have my red meat fix, I am more than glad to fix her something else. Yes and my Mom taught me if I didn’t have anything nice to say don’t say anything at all, so we’ll leave it at that. 😉 Baby Lady says Thumper said the same thing. I never listened to Thumper. I just have this theory that husbands are way nicer – more compassionate and appreciative – the second time around. Divorces are not fun for either side. So it was just a hunch. You asked me what my husband thinks of the sous vide thing? He’s so fascinated. My first photo in 2013 I took what one of him staring at the front of the sous vide machine. Don’t know why, but he was just staring at it! He’s been enjoying my experiments!